IDC, Gartner and other firms have valiantly tried to minimize Apple's real position in the PC industry, building unit sales charts like the one above, which make it appear that Apple is just a bit player in the computing industry dominated by HP, Lenovo, and Dell. These are created by adding up every computer these other vendors build and comparing them only against Apple's Mac-branded systems, notably leaving out iPads. However, the reality is that Apple's unique ability to take its conventional Mac platform and simplify it into the more approachable and broadly usable iPad has paid off dramatically, both in the consumer and enterprise markets. It's also something that PC rivals haven't been able to successfully do. Over the past four quarters, Apple sold 61.74 million iPads and Macs, making it the leader in PC unit shipments, ahead of second-place HP's 57.16 million PCs shipped. But Apple also brought in greater PC revenues and profits, enabling it to invest billions to radically enhance its own macOS and iOS platforms and develop custom A12 and T2 silicon that enhances and differentiates its offerings. In the future, Apple's higher unit sales, revenues, and profits from PC sales will keep making it easier for Apple to innovate in the computing space while HP, Lenovo, Dell and others will continue to be stuck waiting on Microsoft and Intel to chart out their futures. Over the past decade, WinTel has been failing its hardware partners, with no sign of any turnaround on the horizon. 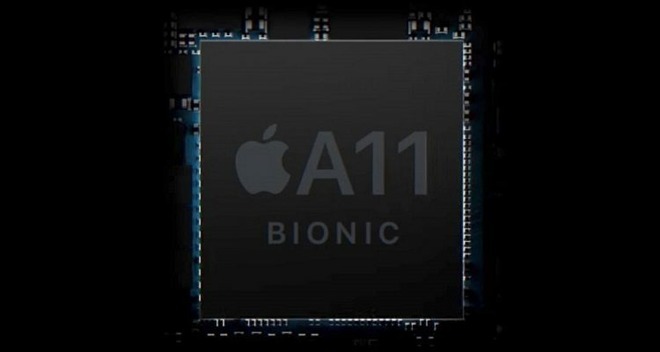 The ARM processors that will likely power an increasing number of PC devices in the future are not held back by Intel, but no other maker apart from Apple is benefitting from the vast economies of scale that iPads are contributing to mobile chips. So while Apple will be able to leverage its existing, highly profitable production of high-end ARM processors for iPads, PC and mobile makers will be starting from scratch, fragmenting the market for PC processors and diluting Intel's existing x86 economies of scale. 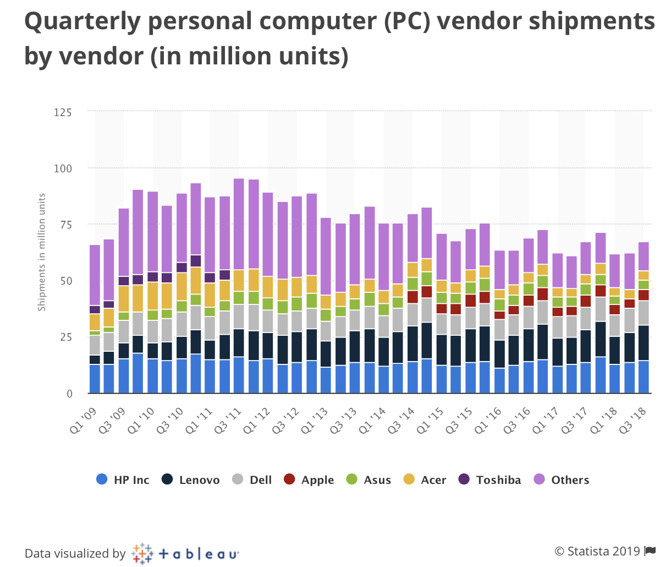 One honest thing that you can see from the chart is that demand for conventional PCs has receded dramatically in the years since iPad appeared, with industry-wide shipments falling by about 25 million units quarterly. In part, that's because conventional uses of PCs have been replaced by smartphones and other mobile technologies. But certainly, the roughly ten million iPads that Apple ships each quarter are also eroding into that demand. Note that Apple's Macs are not suffering the same falloff in sales, meaning that Apple is indeed successfully targeting PCs with iPads, not pursuing a strategy of weaning its Mac users onto iPads. 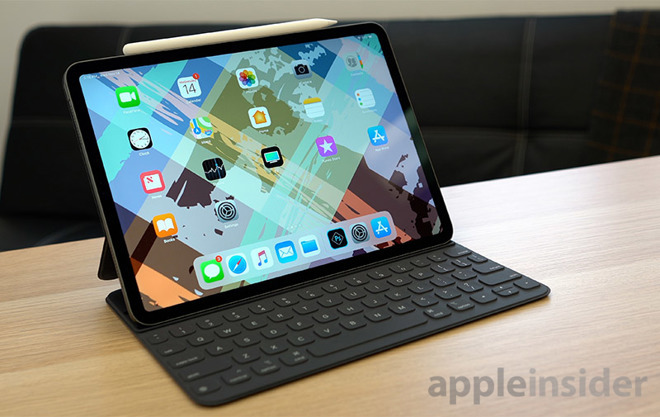 Apple is currently pursuing a strategy that positions iPads as its accessible, affordable entry-level computing product; iPad Pro as a higher end version of that same computing model; Macs as its familiar, yet increasingly iOS-integrated version of conventional computing; and Mac Pro models delivering the high-end version of the Mac experience. Pundits pretend to be befuddled by why they can't plug a mouse or a hard drive into an iPad, but consumers seem to have figured out which products fit their needs best and are having no problem buying them. Microsoft's Surface unable to say "no"
So who is troubled in PCs as the world enters 2019? Certainly Microsoft, which has proven unable to move beyond the conventional PC in either smartphones or mobile tablets or other form factors. Its PC platform shrank twice as fast as Apple's iPad grew, and its own Surface vision of hybrid computing has remained tepidly flat for a decade at a number that's only about a twelfth of the revenue Apple is generating from its range of non-phone computing hardware. 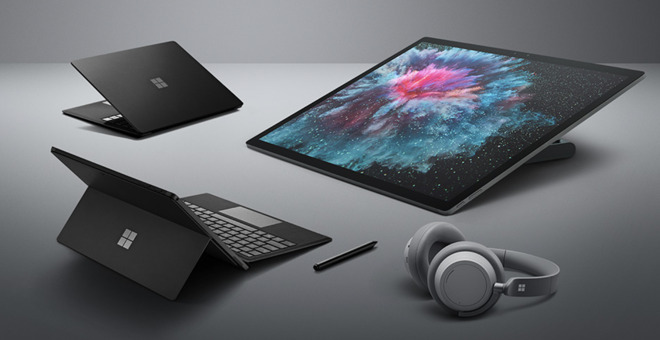 Yet the Surface lineup includes so many various experiments—Microsoft seems almost unable to say no—that the cost of developing and maintaining all those SKUs is significant, crushing any hope of profitability. That makes Surface a profit sink, a distraction away from things Microsoft could be doing. That's the very types of projects that Jobs canceled when he took over Apple in 1997, yet today's pundits demand that Apple take note of the whimsical things being done under the Surface brand and follow Microsoft, rather than pursuing the strategies that Jobs used to turn Apple around. Since 2011, Tim Cook has exercised the same strategies to dramatically grow Apple's sales even as the industries around it continue to slide sideways with distractions that were a waste of resources. Google has similarly shown that it has no real insight into building a PC platform, with Chromebook and Android both failing to deliver a conventional PC, a modern mobile tablet, or some other hybrid experience that any customers want to pay anything for. All it has done is spend tons of money building devices that nobody buys: Chromebook Pixel, Nexus 9, Pixel C, and PixelBook have all been flops. Everyone else in the PC industry is lined up behind Microsoft and Google, waiting for one or both of them to provide the software needed to drive their hardware. They're also largely waiting on Intel to provide the silicon to power it. Efforts to move conventional computing to ARM chips, where there's more competition, have suggested the potential of a new wave driving PC demand. However, overall interest in PCs is clearly waning despite the latest attempts at ARM laptops and netbooks, and Apple is far ahead of anyone else in developing custom ARM silicon to power the next generations of PCs. Pretty clearly, nobody wants "Google's best in a laptop or tablet"
It's also worth noting that any significant movement from PCs to ARM processors will come at the cost of fragmentation of the Windows platform. Those expenses will be incurred by software developers trying to target multiple platforms, as well as two sets of chip designers—Intel and ARM—spending resources to build the future of Windows PCs. On Apple's side, the differences between Macs and iPads are narrowing, both for developers as Apple prepares to introduce the ability to bring iOS AppKit apps to the Mac, and for chip development as Apple moves more of its proprietary tech to custom T2 silicon and as the Ax architecture nears the point where Apple's own SoCs will have the ability to power Macs. Isn't it curious that in 2019, a decade after iPad launched to the howls of embittered naysayers, Apple has continued to grow its Mac sales while at the same time building iPad into an equally large enterprise? And yet all pundits can think about is how Apple desperately needs to choose between them, pontificating about how Apple should either give up Macs, or turn iPads into a Mac in order to move Mac users to iPads, or some equally bizarre advice that makes no sense at all. Meanwhile, they saw nothing but huge potential in Google's parallel failures of Chromebooks and Android tablets, and still see some glimmer of hope for Microsoft's stagnant Surface hobby and a new crop of ARM Windows machines. Microsoft's in it for the long haul, they insist, just like Microsoft said it was for Zune and Windows Phone. The reality today is that Windows has never been less important, and grows ever more irrelevant every year even as Microsoft continues to expand support for its users on iOS and Macs. It doesn't matter if pundits refuse to acknowledge this. It does matter, however, that Apple is lining up broad industry support behind building custom enterprise software for iOS, software that will soon be easy to port to the Mac as well. Even if absolutely nothing were to change across the next ten years in terms of market share shifts, Apple's Mac and iPad businesses would continue to generate nearly half a trillion dollars in revenues for Apple while supporting the development of highly advanced silicon, OS, development frameworks and apps. Windows remains in maintenance mode, getting occasional patches as the market forces driving Intel chips and Windows development slow to a crawl.